We live in interesting times. Whoever thought that so many professionals would be worried about corporate restructuring, layoffs, and downsizing. Keeping your job in today’s unstable business climate takes new ideas and new ways to present yourself – it takes personal branding. Career opportunities have become as competitive as the market itself. Knowing how to differentiate yourself from the pack will make all the difference in your career progression. Personal Branding demands that you put your best foot forward. Taking a lesson from product marketing, you need to find and show your unique value. You must clearly articulate what unique skills and strengths you possess. Your online profiles and resume represent your value statement – what you bring to the table – so it needs to be crisp. Focusing on your strengths can provide you with a strong identity which is uniquely you. Selling your expertise has always involved putting your education and experience on paper (your resume or curriculum vide (CV)). It usually was not until you were face to face with a client, or prospective employer, that you were able to impress them with your point of view. But today you rarely get the chance to have that face moment. You need to wrap your point of view into your social presence. Your online profile needs to not just talk about what you have done, but highlight your point of view, and what you can and want to do for others. A few weeks ago, I wrote a post about identifying your soft and hard skill sets (2 Steps to Understanding Your Hard and Soft Skills). To understand your soft skills, you really need to look at your CORE STRENGTHS. These are the attributes of your personality that drive your ability to excel in certain soft skill areas, and the same one’s that drove your choices in selecting your hard skills (technical training and knowledge). If you look around on LinkedIn or Twitter, you will see that many people define themselves by their titles (VP of Important Things), or the technical and business hard skills that they have (Network Engineer, Physicist), rather than the strengths of their personality (Leader, Innovator). 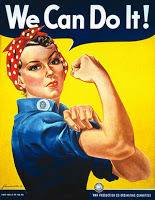 But your core strengths, not your job title, will keep you moving forward in your business career. Core, or personal, strengths, unlike skills, are based on who you are, not what you know. For example, one of my personal strengths is ‘Analytical.’ People with this strength search for reason and causes in things. They think about the factors that might affect a situation. (Gallup StrengthFinder) It is important, as you focus on what makes you unique, to think about what your natural abilities are; the innate talents you were born with. 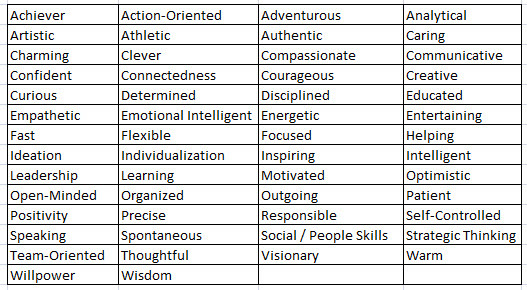 Looking at the list below, pick out 5 or 10 attributes that describe your top strengths. Put them in an order from strongest to weakest. When you build your brand around your unique value, your authentic self, you start to standout from others. Knowing and appreciating what makes you different from your peers and your competitors gives you a handle on what unique qualities you have to offer your team or your employer. And it is in the knewing, that you are able to build a better online presence. It’s also important not to confuse strengths with likes. What you like to do is not necessarily what you do best. It can be, but it’s not a given. Of course, for a successful career you want to combine these two in order to overlap your strengths with your passion. Over time, my core strengths guided me in making choices around work and also my personal life. I chose jobs that felt comfortable and ‘right’ for me – not because I really knew why, but because I tend to ‘trust my gut’ (I am not sure that is a core strength, but it should be). What I have learned over the years is that when my core strengths and my technical and business skills support each other, I tend to really shine in my work (and in my life), and I am the happiest. Leverage your strengths as part of your personal branding process is a must for professionals today. Companies are expecting employees that desire career growth to know who they are and to manage their own eminence. What are your personal strengths and what makes you unique?